Some of Norris’ surprising partnerships include turnip cake with a tangy chive sauce. Photo by Kevin Marple. Her work is where Dallas needs to be heading. 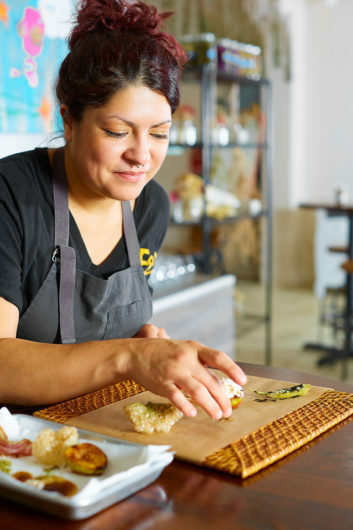 Misti Norris has been recognized by Food & Wine as one of the Best New Chefs of 2019 for her work at the wildly iconoclastic, creative East-Dallas gem Petra and the Beast. The list of ten is a cross-section of talent that reflects a new and inspiring movement in dining. Previous winners include David Chang, Stephanie Izard, and Thomas Keller. But this year, one of the most high-profile chefs is Junghyun Park of Atomix in New York, where a Korean tasting menu delivers history with exquisite precision. What’s fascinating, in fact, is to see how multicultural the roster is. How boundary-pushing. How much the restaurants reflect a new dining ethos. There is Hayato in L.A. with unbelievably elegant bento boxes. House-made soba noodles in delicate bowls and purple broccolini tempura with miso anchovy butter or mustard-stuffed lotus root tempura at Kamonegi in Seattle. The Cambodian food of Nyum Bai in Oakland. The equally rooted cuisine at Jungle Bao Bao in San Juan, Puerto Rico. Or Kith/Kin’s Afro-Caribbean stews, duck and peanut dishes, Ethiopian hot chicken sandwich, and embrace of oxtail at a Michelin-star level in Washington, D.C. Then again, barbecue with heritage-breed pork at B’s Cracklin’ Barbecue. Misti Norris. Photo by Kevin Marple. In this list comes Norris, with the swirls of her cottage ham; her work with farms and fierce commitment to foraging and butchery. Her independence finds expression in the miracles she works with house-made pastas, her foams and seasonal produce, a terrine with, say, pecan, Meyer lemon, and jasmine. A dish of pork, anchovies, fermented elderberries, artichoke vinegar, and pickled pecans is exactly the sort of poetry that enthralled F&W’s restaurant editor Jordana Rothman. Thinking outside the box, though, is exactly what propelled Petra and the Beast into a deserved spotlight, however obscure its location, however ad hoc its details of hanging flower bundles and bleached bones. We are, in Dallas, one of the most terrified dining publics in a major market. We have to get over it. I’ve called Norris a rose in the desert; Rothman dubs her “Ophelia with a meat grinder.” The chalkboard menu at the counter in Norris’s converted vintage gas station is the writing on the wall. I say it’s vital that we see it that way. And, certainly, I see the tide changing in our city. I see an understanding of what is gained when we welcome and embrace a chef’s voice and vision. When we, in fact, allow ourselves to be not just sated, but changed.